Copies of Flee to the Fields normally ship within 3 business days. 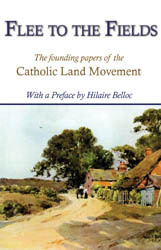 Flee to the Fields is a collection of essays by the leaders of the English Catholic Land Movement explaining the whys and wherefores of life on the land. Spearheaded by men such as Fr. Vincent McNabb, O.P., Commander Herbert Shove, D.S.O., R.N., Harold Robbins, and others, the Movement was a practical embodiment of the salutary truth that economic life must be rooted in the basics of agriculture, property ownership, and freedom. As a practical realization of all of those truths and more, the Catholic Land Movment stands as a model for the modern man who wishes to be radical in his re-assessment of the modern economic system, and in his efforts to get to the root of the problem. The agrarian vision is one that has stood and will stand the test of time as a pillar of civilization. This book expresses that vision in the words of some of England's greatest essayists on the subject. Originally published: London, 1934. IHS Press is pleased to present the original Preface by Hilaire Belloc and a new Foreword to this edition by Dr. Tobias Lanz. Tobias Lanz teaches Politics at the University of South Carolina, Columbia. Join the "forward to the land" movement with your copy of Flee to the Fields. Don't miss this 21st-century crusade!